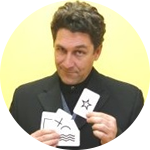 For 20 magical years Steve Baker has performed across Ontario delighting audiences of all ages with family friendly prestidigitation, sleight of hand and mind reading illusions. 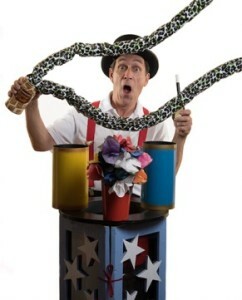 A fully professional actor and magician, Steve brings skills to the stage that blend character and comedy seamlessly with magic from around the world. Steve brings tailor made entertainment to any event including large corporate functions, fairs, festivals, and private parties. 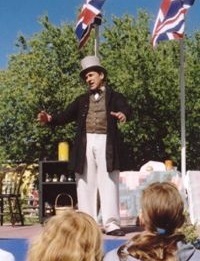 He has worked as a television and theatrical magic consultant and conducted workshops for businesses, government, health professionals, and literally thousands of children at schools, libraries and camps. Baker Magic Shows offers Corporate entertainment and Childrens’ entertainment wherever you are located: from Toronto to Bancroft or from Oakville to Sarnia and anywhere in between. Party Magician! Special Event Shows! Top quality close up corporate strolling & interactive family stage shows. In addition to performing, Steve works as a professional magic consultant for both live theatre and television.